This is a review of the effects pedal Boss GT 100 Version 2. I would like to give brief information about the special features which I think were worth mentioning. Hope the article is useful. The new version came with some new amps and some other new features. So, let's take a look at it features. COSM amps: The GT 100 v2 comes with Boss' Composite Object Sound Modeling (COSM). This makes GT 100 v2 have an amazing recreation of legendary amps and create new innovative sounds. A/B channel divide: This feature will allow you to create two independent patches and select them by picking strength, frequency or a footswitch. This is great for creating unique patches like a clean tone when played lightly and get a chorused tone while playing hard or have a nice overdriven sound in mid-high frequencies and a heavy, high gain tone for the low end. The possibilities are endless. Audio interface: This pedal can send not one but two, stereo sounds to your DAW through MIDI. It can be useful for recording wet sound and simultaneously recording the dry signal for re-amping the signal if in case you want to make some improvement in the sound. User interface: The Boss GT 100 v2 has two 134 x 64 dots backlit screen. It has an intuitive user interface, which makes the user get used to it quickly. 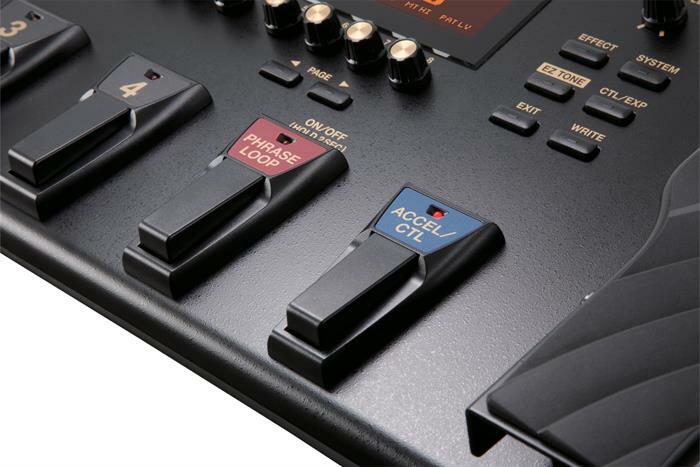 ACCEL pedal: the ACCEL pedal gives you control over multiple parameters on the single pedal. Guitar to MIDI: You can now play your favorite synth plugins or any other plugin, which can be controlled by MIDI, using your guitar. 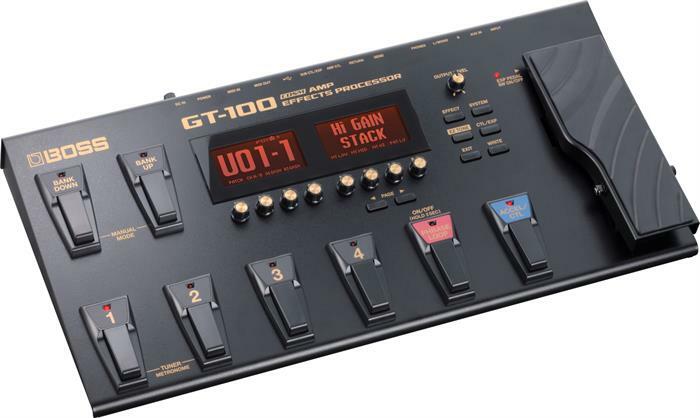 The GT 100 v2 can convert the sound of your guitar (if you are playing one note at a time) into MIDI notes, which can be used for various purposes. Boss Tone Studio: The Boss tone studio gives you the ability to make amazing tone by an eye-catching Graphical Interface; it not only looks great but also works great. It is simple and effective. It shows the signal chain on the top and the patches on the side, and gives generous amount of area for tweaking the parameters. New Rotary Speaker Model: Boss has introduced new Rotary Speaker model, which has a great tone. Boss has added the differences in the horn and the rotary speaker. The GT 100 v2 has 400 program memories out of which, 200 is for the user presets and the other is for the factory presents. It has 44 effects in it. This pedal uses 24 bit + AF method for AD conversion and a 24 bit DA conversion. It has a sample rate of 44.1KHz. It runs on 9V DC and draws about 600mA. This is an amazing pedal include in your rig, it is simple to use, it has great tone, it can even give a nice fat sound for even a weak single coiled guitar. With the version 2 the company has really made it an incredible piece of gear.